At Tablespoon, we try and think outside the box—or in this case, outside the biscuit. We’ve got four genius hacks to turn Pillsbury biscuits into four killer recipes that might probably totally surprise you. Chicken pot pies are amazing, that’s a fact. But we don’t always have time to make them the traditional way. Solution: this recipe uses biscuit dough as the base for a mini that is easy enough to make on a weeknight. Listen up; we’re here to tell you that cake batter isn’t just for birthdays. As a flavor, it makes for delightfully indulgent breakfasts, too. Plus, anything that involves sprinkles in the morning is something we support. You’ve never seen Caprese like this before! Biscuits are the perfect vehicle for loads of melted cheese, turkey, tomatoes and fresh basil. Hello, easy dinner guaranteed to wow. 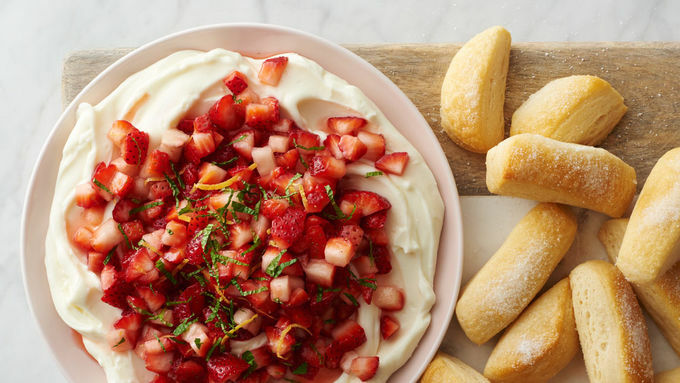 Everyone’s favorite strawberry dessert goes rogue in this killer dip, and we promise you won’t be mad about it. Serve it up with sliced, sugar-dusted biscuits for an awesome dish that is sure to blown minds. Knowledge is power! Let Tablespoon teach you how to cook.